Lisa Bedford is your typical suburban mom of two who likes cute clothes, shopping at the mall, and lives half her life in her vehicle transporting her kids to and from various activities. She also has emergency kits stocked, an evacuation plan and enough extra food supplies to feed her family for at least three months. What? All that survival stuff is not typical? Well, if enough moms read Lisa’s new book, “Survival Mom: How to Prepare Your Family for Everyday Disasters and Worst-Case Scenarios” being a prepared “survival mom” will be the new typical. I received an advance copy of Survival Mom and couldn’t wait to get it open. Now, if you’ve been around preparedness and survival books long enough, you’ve probably noticed how many of them are written by men for men. This one’s different. 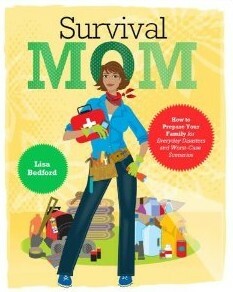 It’s a mom’s survival book (although dads could definitely benefit from reading it as well). In the book, Lisa tackles all the major preparedness topics like water, sanitation, food storage, home and personal security, finances, evacuations, grab and go bags, and more with a mom’s perspective. I don’t know too many other survival manuals that cover much on feminine hygiene or emergency kits for babies. Survival Mom is written so that you can skip around and just focus on the chapters that most interest you, but you’ll want to read the whole thing. It is chock full of good, up to date information on getting yourself and your family prepared and yet somehow it’s not overwhelming. Lisa’s writing style is engaging and witty while covering topics as deadly serious as an EMP strike or having to stay at a FEMA shelter. Oh, and there are fun and inspiring quotes, baby steps to take now, checklists at the end of every chapter, ideas for activities to do with your family, stories from other moms who have survived various life upheavals, and more mixed in making the book that much harder to put down. There is so much useful information written in such an upbeat, “you can do this” kind of tone, Lisa will have you laughing and evaluating and checking off progress in no time. It is the perfect book for the mom who has just come to a realization that she needs to do something to protect her family and doesn’t know where to start or the seasoned prepper who might need a few more ideas or rounding out of their disaster plans. I LOVED this book, and yes, there are some ideas in it that I’ll be trying. 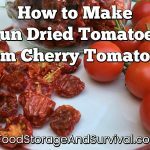 Informative without being tedious, upbeat without making light of serious situations, Survival Mom covers preparedness for the Survival Mom in all of us. 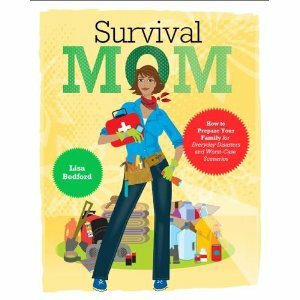 Survival Mom is written by Lisa Bedford who blogs at TheSurvivalMom.com and is available to order starting TODAY (March 13, 2012), so go grab a copy for yourself or a lady you love–this is a book you definitely want in your survival library.